Summary: Do you often feel you spend most of each day in transit between soccer practice, swim team, and saxophone lessons? How many times each week does your family sit down to share a meal and a conversation? When was the last time you all went on vacation together? How often do you make time for your marriage? You may be surprised when you stop to contemplate the answers to these questions -- if so, you aren't alone. In the past 20 years, children's free time has declined by twelve hours a week; time spent on structured sports activities has doubled; family dinners are down by a third; and the number of families taking vacations together has decreased by 28 percent. When Bill Doherty and Barbara Carlson perceived this trend in their own families and communities, they helped to start Putting Family First, an organization committed to helping parents reclaim family time and rebuild family connections. Drawing on their years of hands-on experience as parents and educators, Doherty and Carlson have written a thoughtful and practical guide for finding family balance in a frantic world. 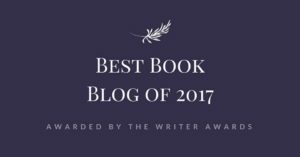 My Review: At the beginning of 2017, I did something that I never do. Or rather, I didn't do something that I always do. Whatever. I skipped goal setting. Instead, I selected a word to guide me through the year and shape my decisions. That word was FOCUS. I wanted to spend my year focusing on what really matters and ridding my life of distractions that pull my attention from where it should be. For me, this meant focusing on my relationship with God, my family, and my health. When I came across this book at Goodwill, it was meant to be (in my shopping cart) and I snapped it up. And let me tell you, I needed to read it. 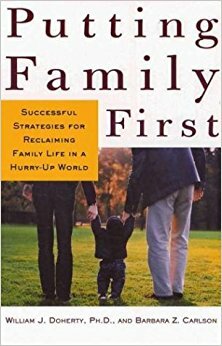 Putting Family First is a somewhat dry, but worthwhile, read that tackles a growing problem in our country. We live in a society that values "success" over anything else and encourages competition at a very young age. Consequently, family time has been pushed by the wayside in favor of numerous after school lessons, sports, and other activities that, while guaranteed to give your five-year-old that extra advantage on college apps, really just leaves children and parents feeling rundown and stressed. Of course, outside activities are not bad in and of themselves, but if not reined in they have the potential to decimate quality family time, which is an essential part of raising emotionally healthy children and creating stable families. If you're feeling over-scheduled and overwhelmed, Putting Family First will essentially give you "permission" to let go of less important activities in favor of more family time, and even give you some helpful tips on how to do it. If you (like me) are feeling guilty for not having your children enrolled in every dance, music, and language class known to man, it reminds you that your four year old does not have to speak French en pointe while playing the violin to be a good person. Putting Family First also recognizes that families come in many forms and has special sections for single-parent families and blended families that give specific details on how to make family time a priority in the trickiest of households. For me, this book was a welcome relief. I am a stay at home mother of four girls and that frequently requires some creative budgeting. I often feel riddled with guilt that they don't get to participate in all the costly activities that so many of their friends seem able to do and I worry that they aren't getting the chance to explore their varied interests and talents. While I still want to find ways to foster their interests, I now realize, as I didn't before, that there is value in family togetherness that can't be replicated with advanced art classes. Putting Family First renewed my commitment to family dinners, bed time rituals (like stories and tucking), spending quality time with my kids, carving out time to date my husband, and helped me to let go of the guilt I've been harboring about all the things we aren't able to provide. I'm so glad that I pushed through the dryness and hope to put much of what I have learned into practice. I highly recommend this book to anyone who is feeling the pressure of the schedule and looking to prioritize. For the sensitive reader: All good. Sum it up: A little dry, but worthwhile. Read it with a glass of water. Summary: Build a lot with a little with this collection of miniscale models! In this inspiring, step-by-step guide, you'll learn how to make the most out of your bricks by building miniature models of vehicles, spacecraft, airplanes, racecars, ships, and more. Fun, compact designs will inspire you to get creative with as few as 75 bricks. LEGO fans of all ages will get hours of entertainment out of building miniscale models that fit in the palm of their hands. 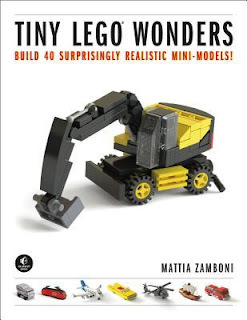 In "Tiny LEGO Wonders," you'll create miniscale models of real vehicles like: a space shuttle, Boeing 747, Concorde plane, and helicopters,Flatbed trucks, and cement mixers, France’s high-speed TGV train, BMW and F1 race cars, Muscle cars, Cargo, cruise, wooden ships, and more! Review: A few years ago we enrolled my son in the Lego MBA program. Every other month he’d receive a Lego kit, along with a book that aimed to help kids find innovative and creative uses for pieces, and then would use the kit to illustrate their point. It was wonderful. My son loved Legos, but this gave him license to create, not just duplicate. It also familiarized him with the pieces and what they could become. As we’ve gone through Tiny Lego Wonders, I’ve watched both my boys experience that same sense of wonder. These instructions are extremely easy to follow. Every piece you need for any of your chosen miniscale model is clearly listed at the beginning of the instruction sheet. And if you’ve ever built a Lego set, you’ll have no problem with these instructions — they could have been created by Lego, they’re so easy to follow! What is more fun than easy instructions are the variety of figures you can create. My boys were thrilled, and for quite a while, this has been one of my son’s favorite books. My shelves are covered with Lego miniscales. Hearing my son’s excitement at discovering and completing these make the displays all worth it. My Review: So. Uh...Hi! My name is Mindy and I am a Potterhead. As this review posts, I am on my way to Universal Studios Wizarding World of Harry Potter with my husband. We are not taking our children and at least two of them are pitching a fit. Oh, they will get to go eventually, but this trip is for the grownup Potterphiles. As such a big fan, it's highly unlikely that I'll be able to give a story set in the Potterverse a fully unbiased review. I'll try...but I thought you should know. 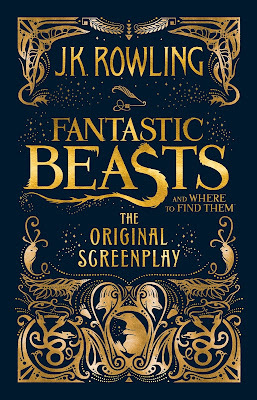 Fantastic Beasts and Where to Find Them isn't really a book, but rather the published screenplay for a movie of the same name that released last year. It is based in the same world as the best-selling Harry Potter series, but set a bit earlier (the 1920s) and in another country (the US). While readers do not have to be acquainted with Rowling's other works to enjoy this one, I do feel that familiarity with the series would make for a richer experience. It didn't take me long to wrap my brain around the screenplay format and just enjoy the ride. 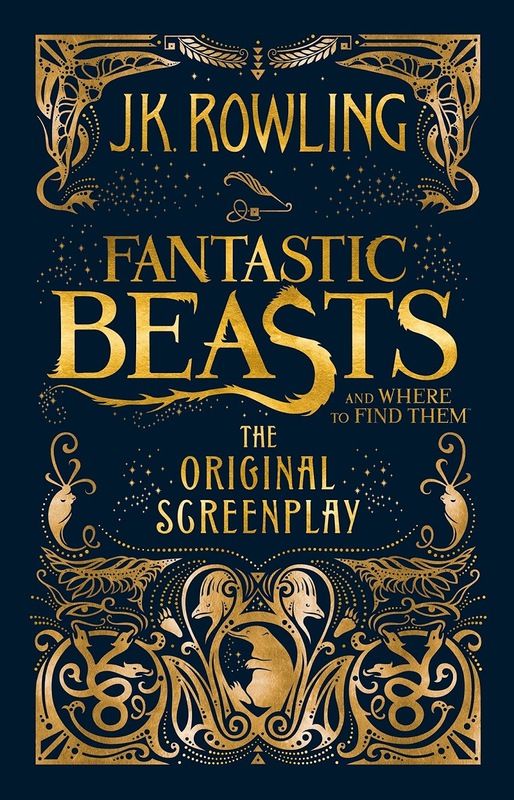 Fantastic Beasts sped out of the gate in the first few pages and didn't stop for much of anything. I finished it in a matter of hours (an experience I sorely needed) and am more excited than ever to see the movie. Overall, I felt it was a delightful afternoon jaunt into familiar world -- humorous and well-paced with some seriously likable characters, interesting animals (that should translate well on the big screen), and some fantastic foreshadowing. And, okay, if I sort of saw the twist coming I wasn't too terribly upset about it. Fantastic Beasts is meant to be the first in (at least) a trilogy. Thankfully, it ended with enough of a resolution that I wasn't tempted to throw it across the room, but left enough unanswered questions to ensure I'll be picking up the next book. Pssssst. The movie comes out on Blu-ray tomorrow, so I'll be watching it as soon as we get back! Sum it up: A delightful jaunt into a familiar world. 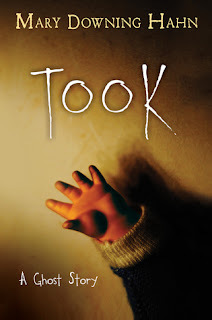 For the Sensitive Reader: As is the usual for these kind of books, there were a few darker scenes that I felt might translate somewhat darker and scarier on the big screen or when read to younger children. Although the book isn't descriptive, there might be a trigger for victims of child abuse. No profanity that I can recall. comes out to on DVD blu-ray tomorrow. Summary: Indulge your inner chocoholic! My Review: I feel like that at this point, if you haven't just gone out and purchased the book right now after seeing the title, even without my review, you just should. I mean, who isn't a chocolate lover? I have met a few people in my life, and I always find I feel like it's hard to trust them. How do you not like chocolate? How do you not want chocolate All The Time? How do you not believe that All The Things should be chocolate? I mean, for reallzz. But apparently I'm a little obsessed. 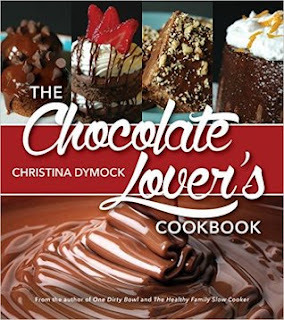 It is no surprise that when given the chance to review this cookbook I just jumped right at it, one hand held high, the other hand gripping my favorite bag of chocolate chips in hopes of starting off right away. Which is what I did. Many times when I get recipe books I make them for my family, and I have to make them one recipe at a time. Or a few recipes for one meal. Very rarely do I just make a ton of things all at once. Not so with this book. Just as I feel like I should always binge on chocolate, I felt like this gave me a very good excuse to actually do that and not look like a complete glutton. Or at least a glutton with a purpose, which is much better, right? My first audience was a game night where we had invited two other couples. I made four of the recipes then. Everybody was super excited when they got to my house and saw all of the amazingness just waiting for them. They all loved it. My second audience was the school librarian. She lets PTA use her lovely library for our meetings, and is generally just a really good support. And she lends me her books. And she likes chocolate. So she was another obvious choice. She was very excited, because those treats apparently arrived just in the nick of time due to some craziness going on at school. They saved her. Chocolate saves. I also took them to a church activity, where it turned out it was a good thing I had tried one ahead of time because I never made it over to the table fast enough to get one at the event before everyone else had taken all of them. Chocolate is delicious, it saves lives, and it makes you popular. What's not to love? As far as the actual recipes go in this book, some I liked better than others. They were all really good, but some I just preferred and would make again regularly. Others I may not make as regularly. However, at game night--when there were six of us tasting all the different treats--everyone preferred something different, so I like that this book has something for everyone. My one complaint is that some of my desserts did not turn out looking like the pictures in the book. I know, I know. This is obvious. People nowadays have some mad skillz when it comes to photographing their recipes. But just be aware that you may not be able to make things look as good as Dymock does. Some did look just as good, but others not as much. Seems obvious, right? If you like chocolate, I recommend this. Highly recommend. There are still several more recipes I am looking forward to trying. This isn't a huge cookbook, but there is enough variety and enough recipes that it will keep you rollin' in the chocolate for some time to come. For the sensitive reader: Chocolate. If this offends you, DON'T READ THIS BOOK. Summary: Tesla’s Attic is the first book in a brilliantly imagined and hilariously written trilogy that combines science, magic, intrigue, and just plain weirdness, about four kids who are caught up in a dangerous plan concocted by the eccentric inventor Nikola Tesla. After their home burns down, fourteen-year-old Nick, his younger brother, and their father move into a ramshackle Victorian house they've inherited. When Nick opens the door to his attic room, he's hit in the head by a toaster. That's just the beginning of his weird experiences with the old junk stored up there. After getting rid of the odd antiques in a garage sale, Nick befriends some local kids-Mitch, Caitlin, and Vincent-and they discover that all of the objects have extraordinary properties. 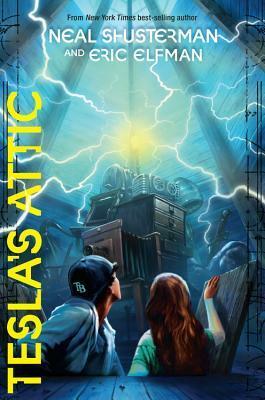 What's more, Nick figures out that the attic is a strange magnetic vortex, which attracts all sorts of trouble. It's as if the attic itself has an intelligence . . . and a purpose. Review: Nick has had a rough year. His idyllic family home and life was destroyed in a minute when his home burned to the ground, taking his mother with it. His father is struggling. His brother is annoying. All Nick has is baseball, and a ramshackle old house they’re stuck living in. In an effort to get his life moving forward again, Nick cleans out the attic (the room he’s also claimed as his own), tries to make a little cash by holding a garage sale, and that’s when things start getting weird. People want his junk. They don't just mildly want it, they’re clamoring for it. It’s somehow calling to them. The deeper Nick digs the more questions he uncovers. Before he knows it, he’s allying with kids from school he never expected, he's struggling to hunt down and retrieve all of that junk he stole, and can you please explain why his attic seems to have developed a gravitational force? I thoroughly enjoyed this book. This is the kind of book you can either hand to your Middle Zone readers and they’ll have it finished in a day or two, or the kind you can enjoy yourself in a few hours when your brain just needs a break. Schusterman’s style is engaging, quick, and intriguing. I enjoyed trying to puzzle out what was going to happen, how everything connected, and finding myself surprised more than once. Of course, our villains are stereotypical. Characters aren’t as complex or as multifaceted as one would expect from an adult novel, but Middle Zone still feels like a very “White Hat/Black Hat” literary area. As long as you remember what you’re reading, I see no problem with that. If you’re looking for Victor Hugo levels of character development and backstory, you’re in the wrong genre. However, if you’re looking for a fun book with a few twists and turns that will keep you (or your kids) engaged, this is a great one to pick up. For the Sensitive Reader: There’s a kiss. It’s not exactly welcome — the girl kind of forces her hand. My Review: When I picked up this book, I was looking for a little light reading to smooth over some stress in my life and this book seemed like it might fit the bill. 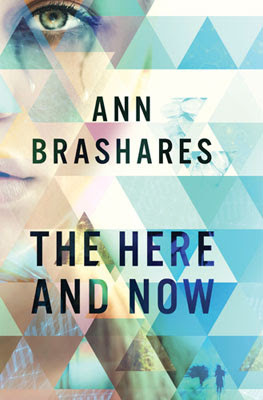 It was written by Ann Brashares, author of the Sister of the Traveling book series, and had a promising premise so I dove in without hesitation. Big mistake. Huge. At 246 pages, I should have been able to finish this book in an afternoon. Unfortunately, it took almost a month for me to wade through. I picked it up with high hopes that slowly tanked as the book fell flat at every turn. The story line felt basic -- like the author had a good idea for a story and put it on paper so she wouldn't forget, but then she went out for coffee or something and her assistant found the manuscript and sent it to the publisher by accident. As characters, I really wanted to like Prenna and Ethan, but they each felt void of any real depth, emotion, or convincing chemistry. In fact, all the characters felt that way. Like paper dolls instead of people. The conflict within the story lacked any real sense of urgency (think, let's take two sentences to make a 'plan' and then go swim suit shopping and make out on the beach) and the subsequent resolution was all too easily reached. The final nail in the coffin? Ethan spent an inordinate amount of time trying to convince Prenna that their physical intimacy was more important than survival. Pardon me while I *eyeroll*. I will give the book credit for not ending in a complete shower of butterflies, rainbows, and glittery unicorn poop, but even that couldn't save it. Honestly, I expected so much more from the author who created Bridget, Lena, Carmen, and Tibby. Lesson? Light reading doesn't not always make good reading. Time to make a 246-page donation to my local thrift store and move on. For the sensitive reader: Some adolescent groping, a murder, and a few instances of profanity. Possibly only one. Sum it up: A promising premise that fails to deliver. Review: Have you ever looked at our map and wondered why some of our states are so bizarrely shaped? Let’s be honest, when you look at a map of our nation, it’s easy to see which lines were designed with natural boundaries (like rivers) in place, but how come West Virginia juts so far north? What’s up with the itty-bitty corner carved out of some states? How come some are so uniform? And if we’re going to be all rigid with our lines, how come some don’t follow a river and are so fluid? 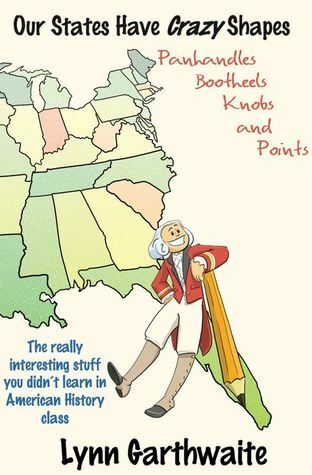 This is a fun book that gives a great overview of each state’s boundaries as approved by Congress. 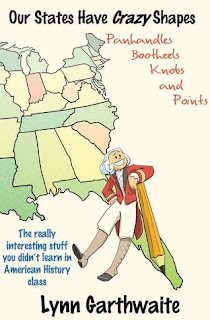 It’s interesting to hear of some of the back-door deals that went on as territorial lines were being decided, noteworthy to see how Jefferson’s ideal design for the nation influenced the sizes and uniformity of the states a century later, and would be a great introductory book for kids interested in geography. However, there were some detractors that heavily influenced my opinion of the book. First, for a book so full of information, I was curious to see the bibliography. Unfortunately, the vast majority of the research seems to be done on Wikipedia. Don’t get me wrong, Wikipedia is awesome for quick fact checks, trying to find the plot lines of one of the characters on a Marvel or a DC Comics TV show, or a two-bit biography on whatever queen you’re binge watching at the moment. But as a research book? I’m not okay with a user-edited content site being the top-visited research tool. When I was taking Argument in college, that was rule NUMBER ONE — don’t use random websites as a main research reference. That hasn’t changed. Second, and more painfully for me, there was too much anti-Mormon sentiment throughout this book. Now, I understand that when the research consists of “Hmm, what does wiki say?” that things can go south quickly, but it was very difficult for me, not only as a Mormon, but as one who has thoroughly researched the formation of many of the territories discussed, to have been subjected to the unnecessary, utterly untruthful, and baffling misrepresentations of a period of history. Unfortunately, it wasn’t just in the “Utah” chapter, but every and any chance the author had to bash Mormonism, it was taken. I take umbrage at the fact that a children’s reference book about how our states’ boundaries were set was used in this manner, and it was frustrating to then not even have true research I could turn to in order to see where the information was coming from. Further, knowing that the information is false (because I did the research myself years ago for work) it called into question the honesty, the impartiality, and the reliability of the rest of the information in the book. I really had high hopes for this book, wanted it to be one my kids would fight over for quite a while (they’re fascinated by stuff like this! ), but I was too taken aback at the tone and lackadaisical attitude to comfortably let my kids read it. This is a pass for me. 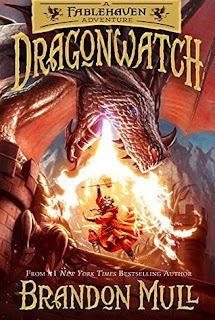 Summary: An exciting and hilarious medieval adventure from the bestselling author of A Tale Dark and Grimm. You can read our review here. My Review: The March reading selection for my book club was a Newbery Honor book from 1969, and let me just say that things have certainly changed. This particular book, Across Five Aprils, was a decent read--better than some early Newberys I've read--but it just doesn't hold a candle to the Newbery winners and honor books that are coming out now. Maybe I'm partial to modern writing (which is certainly true), but I just think that the genre has become quite incredible. The writing is stellar, the stories are touching and poignant, and they have more meaning and depth than they ever have. While there have been improvements in other genres (and some downgrades, too, IMHO), I think that JFic has just soared. Some of the best authors come from the JFic genre, and I just love what is coming out of there. 1. I loved the way it was told. Each chapter is told by a different narrator, although many of the narrators take more than one turn. 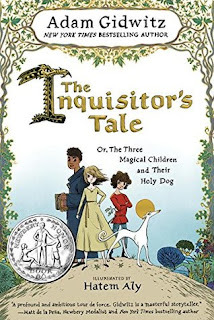 The gig is that they're in a bar in the middle ages (NOT the dark ages, according to the author), and they're taking turns telling stories about these amazing children and their sainted dog. This way of storytelling is a very natural way of getting different viewpoints and different parts of the story, all joined together by a main narrator whose identity we don't find out until the end. 2. This book is funny. Like really funny. It's funny to adults and it's also funny to kids, including things like a dragon who has epic gas and stinky cheese and all sorts of things kids find hilarious. 3. I liked the artwork. I felt like it really added to the story and gave it a very middle ages feel. When I think about this book I think of the art work and the picture it painted for me. 4. I loved the relationships between the children and the dog and the people they encountered. I think Gidwitz did a great job of making these children seem like real kids while also preserving their remarkable abilities. 5. The book just had some really fun stories in it and I loved that they were based on real historical writings. The research had obviously been done, and it was fun to read Gidwitz's impression of what had happened in these somewhat strange and mystical writings. Overall, I would highly recommend this book. It was well-written and a lot of fun and just a really good read. I think my kids will love it and I'm excited to share it with them. It is highly deserving of the Newbery Honor Award. For the sensitive reader: There is some potty humor and mild language, but I will be fine showing it to my 11- and 9-year-old sons. Review: I’ve been so excited for this series for years, I giddily stalked the mailman while I was waiting for my review copy (sorry, Mr. Mailman. ), and I devoured it once I got the chance to read it. And now that it’s time to review it, I don’t even know what to say! How is this possible? Let’s start from the beginning. It’s only been a few months since Kendra and Seth prevented the end of the world. There’s been a lot going on, but apparently during the battle, there were some events set into motion that may have an even more devastating impact than Zzyxx opening its gates and flooding the earth with demons. More specifically, the dragons are getting restless. Kendra and Seth find themselves nominated and whisked off to Wyrmroost, not to help or to visit, but to assume the roles of the new caretakers. Not only do they have to contend with the disrespect and insolence of their joint caretaker, Celebrant, but remember him? He’s the King of the Dragons? If there’s anyone more likely to lead a breakout, it’s Celebrant. I have always liked Brandon Mull’s writing. I appreciate the thought he puts into his stories, the detail and nuance that carries throughout the book, and his ability to create characters who are real and endearing. While I was beyond excited for a continuation of the Fablehaven series, I was concerned it wouldn’t live up to my expectation. It definitely surpassed them. Kendra is still sweet, intelligent, self-conscious, and fairykind. Seth is still a pill, wily, kind-hearted, and more willing to get into trouble than he should. Some of the side characters I loved the most make an appearance, or promise to in the future, and the introduced characters are just as varied and as richly developed as you could hope for. As for the storyline, I’m pleased to say that Mull has surpassed himself here. I’m curious to see this series develop. While some of our villains in the first series were cunning, demons seemed more to be the “take it by force” type of villain. Dragons, however, totally could take it by force, but I got the feeling they’re more James Moriarty than Jean Claude Van Damme. And I’m not going to lie, I prefer my villains to be more of the professorial sort. For the Sensitive Reader: While the action can get a little intense, it’s clean. My Review: The Dogs of Babel is a haunting tale of newfound love, earth shattering loss, and one man's desperate quest for answers. In alternating chapters, Paul and Lexy's history unfolds from their very first (adorable) meeting to their last day together, and explores the present day, in which Paul copes with his grief as he tries to uncover what might have led to her death. The author managed to flit back and forth between past and present, weaving a story both beautiful and tragic that deftly propelled the reader forward to that fateful day when the truth about what really happened comes to light. Although I knew from the beginning how it was all going to end, I still loved hearing the narrator, Paul, tell the story of how they met, fell in love, and married. From the moment he stepped out of his car with square eggs I was hooked. However, as Paul continues to tell their story, it becomes clear that his wife is battling some fierce inner demons and from there the story takes a much darker turn. It felt like I was watching two people (and one dog) on a collision course with tragedy and could only sit there silently, helpless to stop it. Not a pleasant feeling, I assure you, but it makes for an interesting story. Paul's obsession with solving the mystery of his wife's death was understandable, but I was rather skeptical of his attempts to make her dog, the only witness to her death, speak. The absurdity of the idea, even in the face of overwhelming grief, seemed inconsistent with the grounded nature of the rest of the novel and I wasn't sure I'd be able to keep my disbelieving snorts in check. 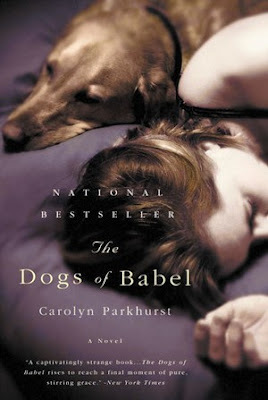 I did find his efforts with the dog quite painful to read, but ultimately, this book was far less about teaching a dog to talk and more an exploration of the intricacies of relationships, the cruelty of mental illness, the overwhelming nature of grief, and lengths a person will go to uncover the truth. I probably won't read this book again, but I did think it was brilliantly written and would recommend it to those who don't mind reading about loss. For the Sensitive Reader: If the summary doesn't make it clear, this book could hold triggers for those dealing with suicidal thoughts or the loss of a loved one. Otherwise, there are some cases of extreme animal cruelty, a handful of swear words (a few more if you count references to a female of the canine persuasion) and a few brief, non-graphic sexual situations. My Review: Mary Downing Hahn is masterful at telling a creepy story. Heck, she delights in it. Seriously. This is the sweet-looking little old lady who, when I met her a few years ago and told her that her book Wait Till Helen Comes scared the crap out of me as a kid, she stopped signing my book, looked up at me, and with this mischievous little smile said, "Good." That being said, I agree with her and love scary stories. I like the mystery and intrigue and overall spookiness, and Hahn manages to do it again and again. So I really, thoroughly enjoyed Took. It felt like I'd been dropped into an old urban legend or folk tale, with the creepy Auntie and her pet, Bloody Bones. I'm always a sucker for a creepy monster and a good ghost story. The story itself is a quick read, but well done. The tale and suspense are built up at a good pace, giving us insight into the town, its people, and their belief in this old folk legend that lurks in everyone's subconscious. The main character's family are the outsiders from the city and can't/won't understand the deep-rooted fears that are commonplace to those who have grown up with the tales of Auntie, which adds to the terror when strange things start to happen and stuff just can't be explained away by logic anymore. It was cleverly told in an alternating way, between Daniel's point of view and Auntie's doings, her bits in particular adding to the intrigue. I also love Daniel's determination to right his wrong and save his sister, even after knowing the true terror of Auntie and Bloody Bones. It's a good coming of age story, a sibling story, and a ghost story all wrapped up in one. For the sensitive reader: trigger warning for anyone who's lost a kid, as the little sister goes missing and the family sort of falls apart over it. There's also the creepy Auntie and her pet that are good and spooky--so not for easily scared types. And I forgot to mention the doll. Dolls are always terrifying. Summary: On the faded Island Books sign hanging over the porch of the Victorian cottage is the motto "No Man Is an Island; Every Book Is a World." 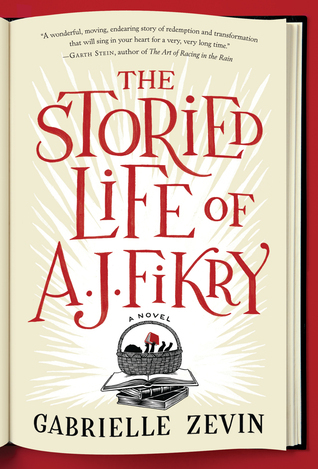 A. J. Fikry, the irascible owner, is about to discover just what that truly means. My Review: I thought this book was a really good read for a couple reasons. First off, I loved the relationship between the main character—the librarian—and his adopted daughter. I don’t want to go into too much detail here because I think it was so fun to discover it (even though a good portion is written on the summary). I think the way they ended up together was fun and perfect for both of them. They deserved each other—and I say that in the best way possible. Secondly, I really loved the support characters in this book. A.J. 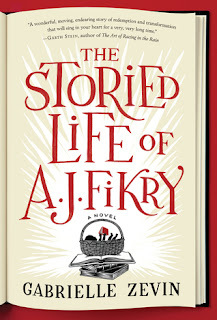 Fikry is obviously a very troubled man, both with good reason and also just because he’s crabby, but the people around him really make his life better and also enrich the story. I find that often characters in books, as in real life, are surrounded by people that they don’t necessarily deserve (because of the way they treat them), but these people stay anyway and most of the time, in the end, it works out better for both of them. I so appreciate this about people, actually, that they’re willing to put up with someone and all their flaws and love them anyway. Don’t you just love this quote? I think it is so true. The older I get, the more I can relate to this. For instance, I don’t know if you’ve ever gone back and re-read books that you LOVED as a child, but they don’t always strike you the same way. I used to tell everyone that A Wrinkle in Time was one of my favorite books. I went back and re-read it a few years ago and…I thought it was the weirdest thing ever. Seriously. I had no idea what was going on and I didn’t like the characters and I thought it was just dumb. Sorry, Ms. L’engle. It just wasn’t my thing. However, I remember being so touched by it when I was younger and found it really profound. I’m not sure why I thought that or what about it I really liked, but I loved it. To me, this is an obvious example of a book coming at just the right time and changing me in a way then that could never be replicated at another time in my life. And truly there is never a greater connection to a book or a story than when it comes at precisely the right time in our lives. Indeed this is why I find it hard to judge people about the books they love. Stories and books strike us in different ways at different times in our lives. Who am I to judge what story someone loves when I don’t know the truth about their situation right now in their life? And who knows what that story had in it that that person needed right at that time? Don’t worry, I do a fair amount of judging for those who read [what I consider to be] ridiculous. But really. I should be more tolerant. I think this is a very wise book about people trying to make the best of situations that varied from troublesome to downright tragic. There was happiness too, though, of course, and I think this book did a good job of addressing both the good and the bad and putting it into perspective. For the sensitive reader: There is some language in this book, and I’m always a little shocked when the “F—“ word comes up at what I feel to be unnecessary times. Summary: A girl and the wolves who love her embark on a rescue mission through Russian wilderness in this lyrical tale from the author of the acclaimed Rooftoppers and Cartwheeling in Thunderstorms. My Review: "Once upon a time, there was a dark and stormy girl." 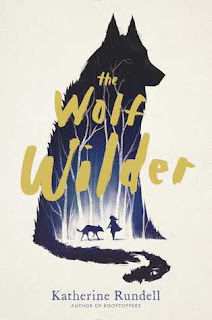 The Wolf Wilder was a fascinating story, a mythical Russia of ages ago where tame wolves needed to be taught how to be wild, and relied on those who did that (an idea so intriguing to me that I found myself thinking, 'can I have that job please?'). But woven within is a story of human nature, of people beaten and driven down who must reclaim their own identities against cruel tyrants who fight to smother it. I loved Feo. This girl is a fierce, feisty little ball of sinew and spit, raised with wolves and by a mother who wilds them. Her relationship with these animals is the deepest kind of friendship, she respects them, knows they are not pets, even when they are not completely wild, but she is there for them even when they snap at her, and they are there for her when she most needs them. Her friend Ilya is also a complex character, a boy who never wanted to be a soldier, who has deeper dreams but does all he can to help Feo rescue her mother and falls in love with the wolves. I loved how basically all the main characters in this book were kids, how they were the ones starting the revolutions, they were the ones fighting for the world they had to live in. And they are scared to do it, but they do it anyway. This book was filled with beautiful writing. The turns of phrases Rundell used were so unique and picturesque, evoking true feelings in a way I never would have thought to phrase it. For the sensitive reader: These characters are being hunted by a very merciless man and, such being the case, there are losses along the way, but it is dealt with in a gentle manner, even through the sorrow. Summary: Every year, the people of the Protectorate leave a baby as an offering to the witch who lives in the forest. They hope this sacrifice will keep her from terrorizing their town. But the witch in the forest, Xan, is kind and gentle. She shares her home with a wise Swamp Monster named Glerk and a Perfectly Tiny Dragon, Fyrian. Xan rescues the abandoned children and deliver them to welcoming families on the other side of the forest, nourishing the babies with starlight on the journey. My Review: My kids’ elementary school librarian is awesome and also a book reviewer. Yes, they go together. Whenever I see her (which is quite often because she generously allows us to use her super cute library to hold PTA and parent meetings) she has some great suggestions for me, and great suggestions for my kids, too. Don’t you think it’s great when a librarian knows your kids enough to know what they would like? She is always in the know about new books coming out, and had read The Girl Who Drank the Moon before it was chosen for the Newbery Award this year. She kept telling me “They got it right” and then graciously lent me her copy, as well as copies of the Newbery Award Honor books, so watch for those reviews coming soon! I think it’s so fun to see the variety that the Newbery Awards have. They really vary quite a bit, and the quality varies quite a bit, especially as you go further back. I’ve read lots of Newbery winners, as I’m sure you have, and I’d have to say that I personally believe that the quality has gotten better and better with time. Many of the first award winners couldn’t have held up to the competition of the winners nowadays, or even the honorable mentions. Competition has gotten really stiff in the JFic genre, and I, for one, have very much enjoyed what it has to offer. I loved the fairytale nature of this book. I love a lot of the JFic books because of their ability to handle real life situations in a way that is honest and sensitive, but without the drama and heaviness of an adult novel. This book does that, but in more of a fairytale way. I loved the characters and their nuances. I also love JFic books because they often spell out their message, which I appreciate. I don’t always like to be guessing what’s supposed to be happening. Then again, I don’t like to be hit over the head with the message, either. Well-written JFic is able to strike a balance between letting the reader know what the message is while still not feeling heavy-handed or manipulative. 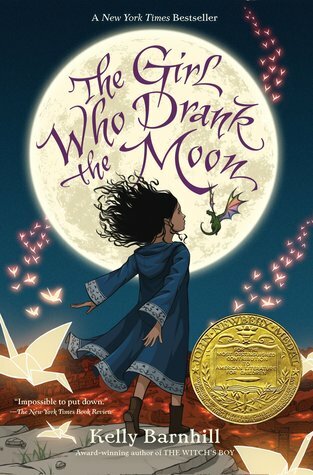 One thing that impressed me about The Girl Who Drank the Moon was the depth and nuance of the characters. They weren’t one-dimensional, and they weren’t all perfect. There were heroes and heroines who made wrong choices for the right reasons, and there were villains who also tried to do good things, even if they were not good in the end. Really, despite the fantastical nature of the story and the characters, they really were relatable. What genre allows you to appreciate and love a bog monster if not JFic? I loved that about it. Also, some of the characters are damaged and they aren’t made all better in the end, which I also appreciated. Not everyone is perfect and undamaged in real life and this book does a good job of addressing this. I think this book’s strength was its allegorical nature. This is not a simply written book, and I would say that it probably demands quite a bit from its middle grade readers, but in a good way. It will challenge their reading skills because this isn’t a book with a few big words on each page, but it is interesting and captivating and they will enjoy and relate to the characters. There is some sadness and tragedy as children are stolen from families to be sacrificed to a witch, but I think this was taken to the edge and then stepped back when we find out about what happens to the children. I highly recommend this book, not only if you’re collecting notches in your belt for Newbery Awards you’ve read, but also because it is an insightful book with strong characters and good writing. For the sensitive reader: The children being taken from the families to be sacrificed is sad.